Actinomycosis is an infrequent bacterial infection encountered nowadays, caused by anaerobic Gram-negative bacterium of Actinomyces species. We report an unusual case of a unilateral tonsillar hypertrophy in a 40-year-old male, caused by actinomycosis masquerading as malignant tumor. To the best of our knowledge, only seven cases of actinomycosis causing unilateral tonsillar hypertrophy have previously been published. Since this anaerobic organism is difficult to culture, the diagnosis is made by observing its associated sulfur granules in the biopsy specimens. Still, actinomycosis represents an important entity in today's context as it is the great masquerader of the head-and-neck lesions because of its myriad presentation that may mimic other common diseases, the difficulties involved in its diagnosis, and the long course of treatment mandatory to eradicate the disease. Actinomycosis, caused by Actinomyces, is a saprophytic infection characterized by granulomatous and suppurative lesions that usually spread into adjacent soft tissues without regard for tissue planes or lymphatic drainage. The incidence of the presence of actinomycosis in tonsils has recently reported to be 6.7%–28.5%., The role of Actinomyces in the disease of tonsil is not clearly understood. It has been suggested that this infection may indicate an etiological role in tonsillar and adenoidal hypertrophy.,,,, It is an infrequent bacterial infection encountered nowadays because of the widespread use of antibacterial antibiotics. Still, actinomycosis represents an important entity in today's context as it is the great masquerader of the head-and-neck lesions because of its myriad presentation that may mimic other common diseases, the difficulties involved in its diagnosis, and the long course of treatment mandatory to eradicate the disease. The case is being reported because of its unusual presentation as per the literature published worldwide. Relevant sources were identified by a PubMed/MEDLINE search for databases using the keywords actinomycosis, tonsil, unilateral, and hypertrophy. A total of only seven cases of unilateral tonsillar hypertrophy caused by Actinomyces infection have been reported until now.,,,,,, We report an unusual case of a unilateral tonsillar hypertrophy caused by actinomycosis masquerading as malignant tumor. A 40-year-old man was referred to the Department of Otolaryngology with a 2-month history of dysphagia and pharyngeal discomfort. He had no episodes of fever and denied any history of oromaxillofacial trauma or recent dental extraction. General physical and systemic examinations were normal. There was no palpable cervical lymph node. Oropharyngeal examination revealed enlargement of the left-sided tonsil, which was firm on palpation. The mucosa was normal and there was no apparent abscess or discharging sinus. The right tonsil was of normal size and appearance. Nasal, nasopharyngeal, and laryngeal examinations were normal. Computed tomography (CT) scan did not reveal any significant finding. Routine laboratory investigations were normal. A clinical diagnosis of malignant tumor was made and he underwent left tonsillectomy. Grossly, an enlarged gray-white left tonsillar specimen of 5.5 cm × 3 cm × 1 cm appearing homogeneous on cut section was received. 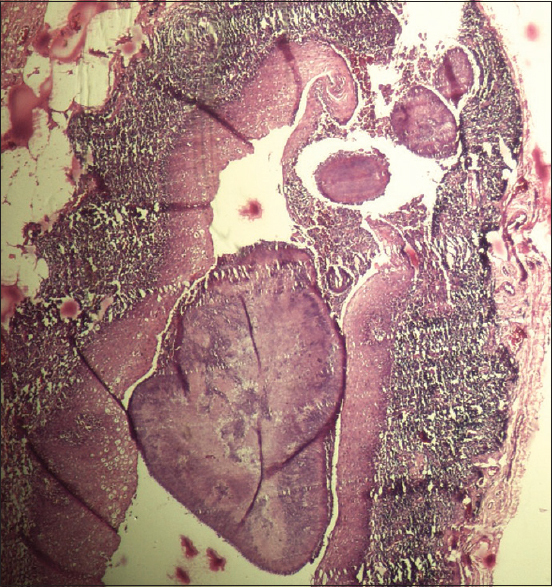 Histopathology revealed reactive lymphoid hyperplasia and colonies of Actinomyces in dilated tonsillar crypts [Figure 1]. There were numerous sulfur granules composed of colonies of filamentous bacteria with peripherally situated basophilic branching filaments radiating from the center [Figure 2]. The central portion of the granule shows an aggregate of haphazardly arranged filaments. In addition, peripherally situated hyaline eosinophilic material representing the “Splendore–Hoeppli” reaction was seen. There was dense polymorphonuclear infiltration around each colony, surrounded by necrosis and chronic granulation tissue. 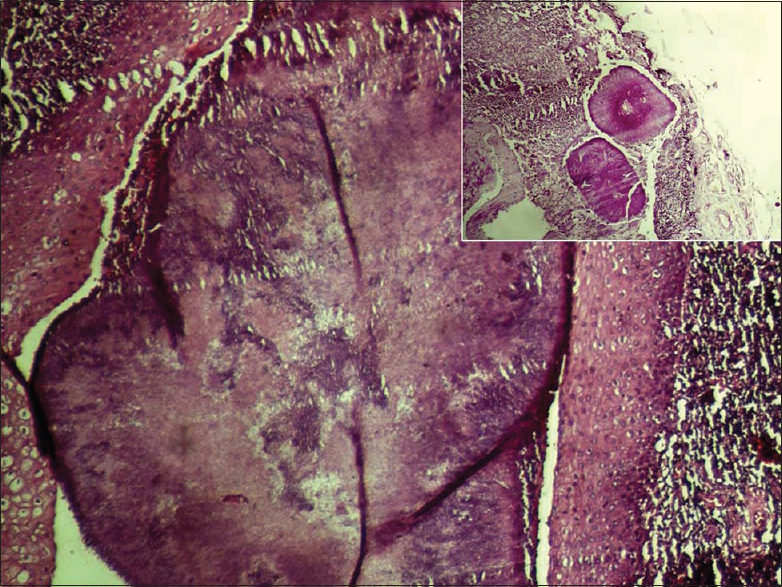 The Ziehl–Neelsen stain was negative for acid-fast bacilli. The organisms appeared blue and red after staining with Gram-stain and periodic acid–Schiff's stain [[Figure 2], inset], respectively. A diagnosis of tonsillar actinomycosis was rendered. The patient was started empirically on oral penicillin 500 mg 6 hourly for 3 weeks with complete clinical response and no recurrence of the infection on follow-up. Actinomycosis is a rare, subacute, or chronic bacterial infection, characterized by localized swelling with suppuration, abscess formation, and tissue fibrosis. The classic formation of spontaneous sinus tracts draining purulent material that contains yellow granules (sulfur granules) is observed in approximately 40% of cases, and when present, can help in diagnosis. The common clinical presentation sites are cervicofacial, thoracic, abdominal, and pelvic. Actinomyces are Gram-positive, nonacid-fast, anaerobic, or microaerophilic filamentous branched bacteria which are very difficult to culture, with <30% of cultures being positive. In males, the pathogenic Actinomyces most frequently isolated is A. israelii. The organisms are usually tangled together in a matted colony forming a granule or grain, commonly termed “sulfur granules” and may be 20 μm to 4 mm in diameter. The bacilli within are 1 μm diameter filaments that are hematoxyphilic, Gram positive, and also stain with the Grocott's silver method. The peripheral filaments often terminate in a club. A “Splendore–Hoeppli” phenomenon may be found peripheral to the bacteria. In addition, polymerase chain reaction using the 16S ribosomal RNA gene amplification has been developed for the diagnosis of actinomycosis. Unlike most of the mycotic infections, actinomycosis is not an opportunistic infection and the portal of entry is not through inhalation. They reside as a commensal organism in the oral cavity and respiratory and digestive tracts and are unable to penetrate healthy tissue to cause infection. The underlying disease and interruption of mucocutaneous barriers predispose a person to actinomycosis by providing a medium in which these endogenous organisms can invade, proliferate, and disseminate. The disease may develop with or without antecedent injury to the oral mucosa. Frequently, however, cervicofacial infection is often a sequel to dental caries, periodontal disease, or injury to the oral mucosa. In our case, the patient denied any clinical history of oromaxillofacial trauma and showed no signs of immunodeficiency. Actinomycetes being an anaerobe releases proteolytic enzymes, causing diminished oxidation–reduction potential and this leads to the proliferation and colonization of the tonsillar crypts by the organisms. However, it should be kept in mind that actinomycosis acts as pathogenic agent of tonsillar hypertrophy even in healthy individuals as seen in our case. Unilateral tonsillar enlargement is considered to be a sign of a potential tonsillar malignancy. In a series from University of Lowa, Beaty et al. reported that the strongest risk factor for predicting tonsillar malignancy was tonsillar asymmetry, which occurred in 21 of 25 patients with a tonsillar neoplasm. The unilateral enlargement of a tonsil and dysphagia evoked the suspicion of malignancy in our patient also, but there was absence of an occult malignancy. Tonsillar actinomycosis is usually a bilateral feature. Although actinomycosis can be detected in the tonsil comparatively frequently,, there are only seven reports indicating that actinomycosis is relevant to unilateral tonsillar hypertrophy, as shown in [Table 1]. Three of them were masquerading as a tumor;,, two were pendulous mass attached to the tonsil,, one with recurrent tonsillitis, and one of the cases presenting as a tonsillolith. In the unilateral tonsillar enlargement, the clinicians must suspect unusual infections such as botryomycosis, nocardiosis, Mycobacterium tuberculosis, atypical mycobacterium, or actinomycosis in the differential diagnosis. Furthermore, preoperative investigations are not effective in making the diagnosis since this anaerobic organism is difficult to culture and imaging techniques usually yield nonspecific findings, contributing only to define radiological features of the mass. That is why diagnosis is very difficult and definitive treatment in most cases may be established only by histopathological examination. Classical surgical excision is thought to be the definitive treatment for cervicofacial actinomycosis, and tonsillectomy is usually curative for tonsillar actinomycosis.,,, The infection can be treated effectively with beta-lactam agents combined with beta-lactamase inhibitors. To conclude, although actinomycosis can be detected in the tonsil comparatively frequently, unilateral tonsillar hypertrophy caused by actinomycosis is rarely encountered in clinical practice. Probably, insufficient recognition among otolaryngologists may be one of the reasons. It is the great masquerader of the head-and-neck lesions, sometimes mimicking malignancy and may mislead the diagnosis. Also, preoperative investigations (radiological scans, culture throat, tonsillar biopsy, and fine-needle aspiration cytology) are not effective in making the diagnosis. Clinicians should remain alert to the possibility of actinomycosis. Proper recognition and diagnosis is important because of the long-term therapy needed to successfully treat the infection. Rasić D, Perić A, Vukomanović-Durdević B. A case of an unilateral tonsillar hypertrophy caused by actinomycosis. Acta Medica (Hradec Kralove) 2010;53:31-3. Bhargava D, Bhusnurmath B, Sundaram KR, Raman R, Al Okbi HM, Al Abri R, et al. Tonsillar actinomycosis: A clinicopathological study. Acta Trop 2001;80:163-8. Samant S, Sandoe J, High A, Makura ZG. Actinomycosis mimicking a tonsillar neoplasm in an elderly diabetic patient. Br J Oral Maxillofac Surg 2009;47:417-8. Takasaki K, Kitaoka K, Kaieda S, Hayashi T, Abe K, Takahashi H, et al. Acase of actinomycosis causing unilateral tonsillar hypertrophy. Acta Otolaryngol 2006;126:1001-4. Yadav SP, Chanda R, Gathwala G, Yadav RK. Actinomycosis of tonsil masquerading as tumour in a 12-year old child. Int J Pediatr Otorhinolaryngol 2002;63:73-5. Hirai S, Akisada T, Yoshihiro T, Take T, Orita Y. A case report of a pendulous tonsil induced by Actinomyces infection. Pract Otol (Kyoto) 1998;96:146-8. Morikawa I, Shin T, Watanabe H, Matsuo K, Yukizane K. Actinomycosis originating from palatine tonsil and its diagnosis. Otol Fukuoka 1985;31:382-6. Cohen PR, Tschen JA. Tonsillar actinomycosis mimicking a tonsillolith: Colonization of the palantine tonsil presenting as a foul-smelling, removable, unilateral, giant tonsillar concretion. Int J Dermatol 2010;49:1165-8. Chandler FW, Connor DH. Actinomycosis. In: Pathology of Infectious Diseases. Vol. 1. Ch. 40. Stamford, Connecticut: Appleton & Lange; 1997. p. 391-6. Venkatesh K, Saini ML, Niveditha SR. Fine needle aspiration cytology of cervicofacial actinomycosis. J Cytol 2008;25:113-4. Beaty MM, Funk GF, Karnell LH, Graham SM, McCulloch TM, Hoffman HT, et al. Risk factors for malignancy in adult tonsils. Head Neck 1998;20:399-403.